No extra plan costs for you? No detailed medical questions for your members? It’s the perfect time to consider Personal Life. You want to offer more benefit options to your members. You’re also under pressure to keep your costs and administrative efforts in check. It’s a challenge to do both! But we’re here to help – with enhancements to our Personal Life offering. Did you know only 16% of Canadians say they’ve bought enough life insurance to cover their remaining mortgage payments if they die?1 Providing easier access to life insurance is a solution to help your members address the gap. It can have a true impact in their lives. Personal Life is a great option! It’s a voluntary benefit that helps members get life insurance coverage beyond the basic coverage available through their plan. It’s flexible for your members and it offers an easier way for you to add value to your plan. And with our current enhancement we’ve made it even easier for members to get the life insurance they need. 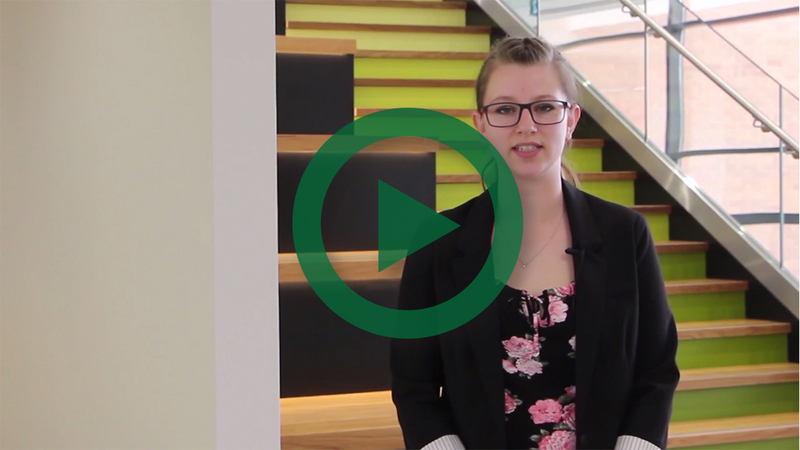 Check out ‘What’s new?’ for more information. Advantages for you Advantages for your members What’s new? Talk with your representative at The Manufacturers Life Insurance Company (“Manulife”) to get started. 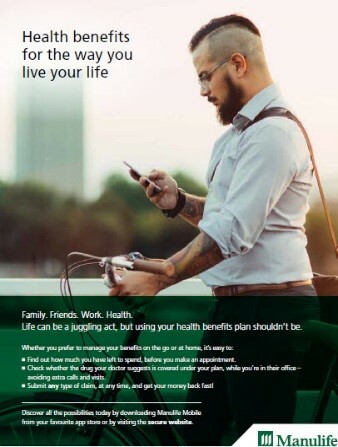 If you currently offer Personal Life through your benefits plan, your plan will automatically move to the enhanced offering during your next renewal. We’ll let you know more about how the change will happen when we get closer to the date. Stay tuned for more information! 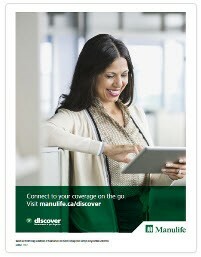 Give your Manulife representative a call! We’re here to help. *A 24-month pre-existing condition clause still applies for coverage that has been purchased without providing detailed medical information (amount up to $100,000 for members and $50,000 for their spouse). ** Coverage for children hasn’t changed. Our standard is a flat $20,000 in coverage for each child with no medical details needed. New features have been added to the plan member secure site. Members can now view their online claim submission status, the type of claim it was for as well as who the claim was for. The number of claims a member can see has increased from 5 to up to 50. 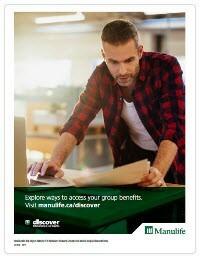 Recently, we told you how Manulife is changing its messages to make them easier to understand and act on. We’ve taken another big, bold step. We’ve completely transformed the letters we use in our disability area. Our new messages make great use of photos, graphics, charts, colour and modern formatting. The letters use proven scientific insights into human behavior to convey messages that will help motivate members in their journey to recovery. Plan members and sponsors will start seeing them very soon. We believe with the right resources, employees can lead happier, healthier lives – and when they do, organizations become stronger and healthier too. 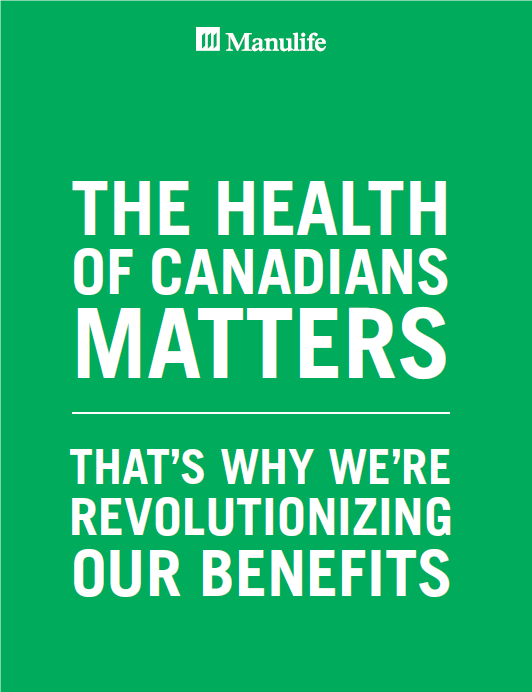 That’s why we’ve partnered with Manulife Bank to revolutionize our benefits. 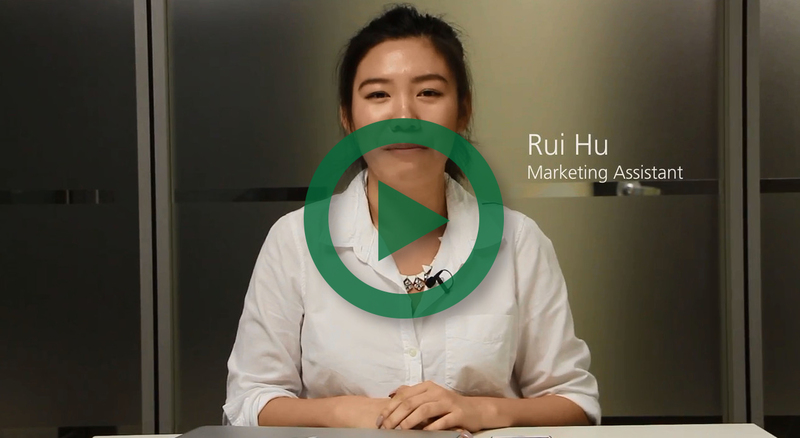 Manulife Bank’s all-in-one solutions are simple and flexible. No more hidden fees, misleading offers or superficial rewards. Your plan members could get value they may not be experiencing with their bank today. Access to these exclusive bank offers requires no work on your part, and we’ve developed a simple and engaging experience for your plan members. We’ve posted a banner on the homepage of the plan member secure site and a simple click will take them to more information. It’s that easy. 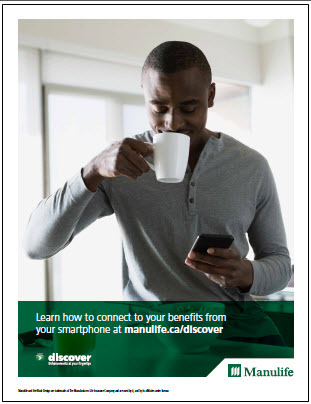 Talk to your Manulife Representative to learn more about our exclusive bank offers. * Some terms and conditions apply. †Trademark of Visa International Service Association and used under licence. Read the brochure for more details about these solutions and exclusive offers. We recently asked plan members to help us identify moments in life that cause them the most financial and emotional stress. In total we’ve identified 18. We wanted to do something to help them alleviate some of this stress. As a result, the Life Moments team was born. What does this mean to plan members? No more having to call multiple numbers during these sometimes-difficult times. The Life Moments team, will serve as a single point of contact. 18 life moments are a lot! So, we’ve decided to tackle these one at a time, starting with the death of a loved one. 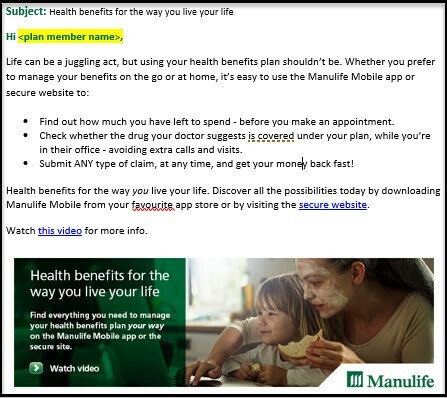 When the Life Moments team gets a call to notify them of the passing of a plan member, they’ll run a search for other possible products the member might have with Manulife. Once they have all the information they need, they’ll coordinate all necessary notifications across the organization on behalf of the caller and get the claims process started. We want to make this time as easy as possible for members and having a single point of contact, is a step in the right direction. Over the next couple of months, we’ll look to help members with additional life moments. 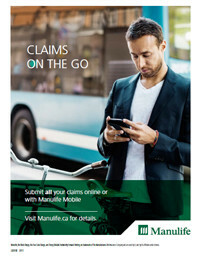 If you have any questions, reach out to your Manulife Representative. In today’s workplace, employees want more flexibility and choice especially when it comes to their health benefits. With our enhanced Health Care Spending Account (HCSA) and Lifestyle Spending Account (formerly known as our Taxable Spending Account), you can give your plan members more choice to spend their benefits dollars in a way that’s best for them, while you can better control your plan costs. By offering an HCSA and/or LSA, you can boost your group benefits plan by providing coverage flexibility and choice that will help attract and retain employees. An HCSA is a tax-deductible expense for your company and provides plan members with tax-free coverage of expenses normally associated with a health and dental benefits plan. A Lifestyle Spending Account is taxable benefit for plan members that can help support their overall well-being and reduce workplace absenteeism. Things such as gym memberships, child and pet care expenses, and public transit passes are just a few examples of eligible expenses. Submitting HSCA/LSA claims can be done online or using the mobile app, which makes the process quick and easy for your members. If you want to know more about our enhanced Spending Accounts, contact your representative at The Manufacturers Life Insurance Company (Manulife). Benefits fraud: turns out, prevention is the key. When it comes to your benefits plan, keeping costs down is a priority. And stopping any misuse and abuse of it is critical. That’s why we’re doing something different. It’s time to think about prevention first. So, what does this look like? Your plan members are key. Why not engage them through information and empower them to be part of the solution. A refreshed site makes this easy to do. Ready-to-use campaigns can help your members to make smart decisions and practice good claims behaviour so they don’t put your plan at risk. When your members see suspicious claims, they can use the new Share and Protect e-form. It’s an easy and confidential way for your members to tell us about it, so we can look into it. 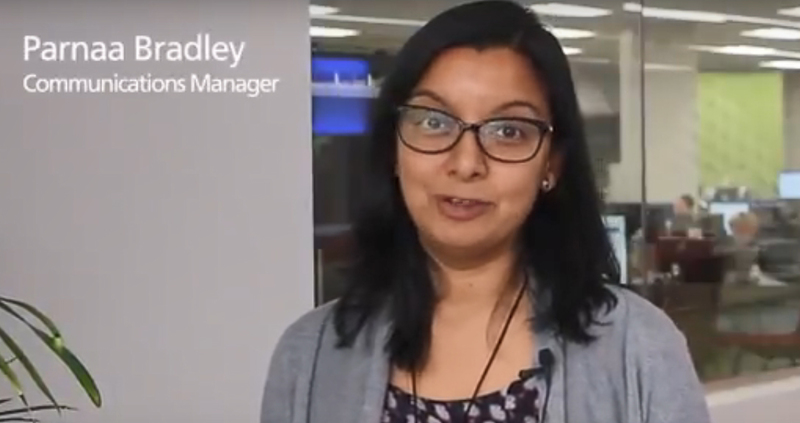 We’ve launched a Trusted Provider Network pilot to help you and your members work with professional and ethical service providers. It’s early, but we’re already seeing very positive results. And rest assured, when suspicious claims are made, our dedicated team of experts, with state of the art analytics systems, are on the case. This is just the beginning of our new approach to protecting your plan. There’s so much more on the horizon. Stay tuned! 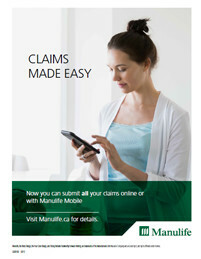 Manulife plan members were the first in Canada to be able to file every claim online! Since we launched, members have submitted over 5 million claims online. Over a million of those online claims were through a mobile device. People use their phones to do just about everything these days – add to that submitting their group benefit claims. A year ago, we also launched a new convenient app that is fast and easy to use. 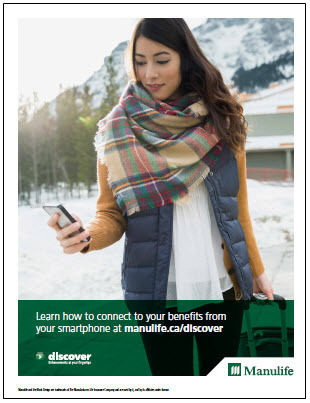 If you have questions, call your Manulife representative. Starting a new chapter in life can bring a lot of change. 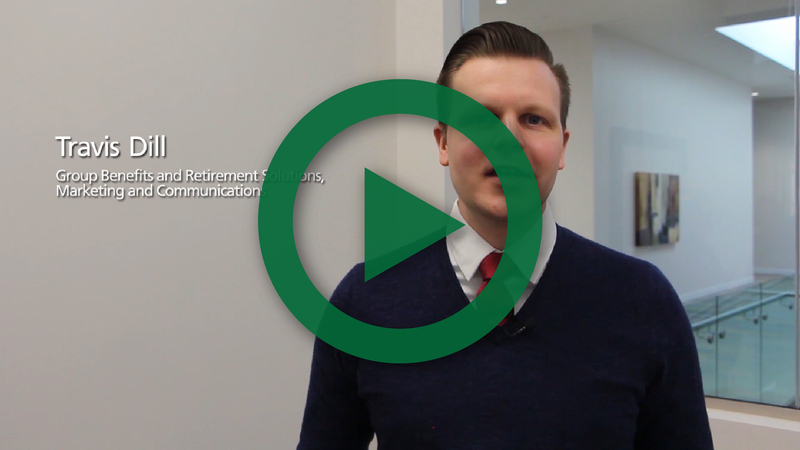 Whether they’re retiring, or taking on their next challenge, members who are leaving your group plan will have important decisions to make about their ongoing benefits needs. Having the option to buy coverage through My Next Chapter can help them make the transition. 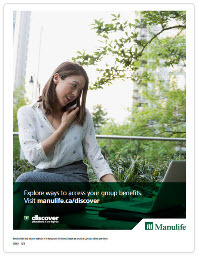 Through My Next Chapter, Manulife helps members who are leaving your group plan at any stage of life learn about our FollowMe™ and Flexcare® programs. They’ll get information on the different individual health and dental options available to them. More than 10 different plan combinations are offered to meet their needs. It’s an easy and convenient transition solution, offered at no cost for your organization. Easy administration – we’ll connect with members who are leaving your plan directly, using the member data we have on file. We’ll answer their questions and take care of next steps. 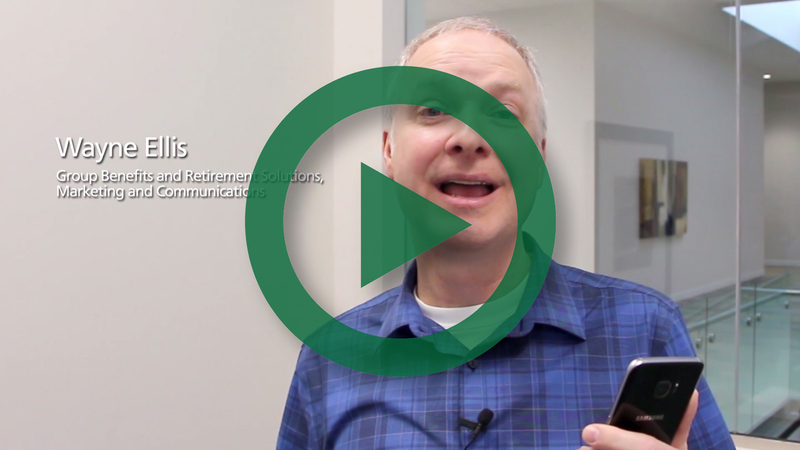 Mailings will go out to members who are retiring, or otherwise leaving your organization. In the mailing, members will get a letter and promotional materials, telling them about FollowMe and Flexcare – our products designed for individual coverage. These products can provide similar benefits to their group plan coverage. We’ll also invite employees to visit MyNextChapter.ca or call the toll-free number (1-844-732-4237) to talk to a Licensed Insurance Advisor. Through either channel, they can learn more about their available options, get a quote, or buy the solution that best meets their needs. 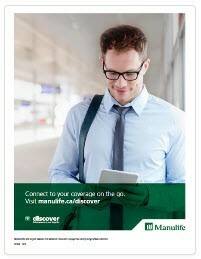 For more information about My Next Chapter, please contact your Manulife representative. *Guaranteed acceptance dependent upon receipt of the first premium payment and satisfaction of eligibility criteria. 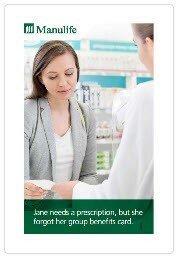 For Quebec residents only: to be eligible for a FollowMe or Flexcare plan, Quebec residents must also have RAMQ prescription drug coverage. Online member services are getting a whole lot easier! Earlier this year we told you about some exciting enhancements we’re working on to make online services easier and more personalized for your plan members. And we promised we’d keep you updated on our progress. No more struggling to remember their plan contract number or certificate number – your plan members will be able to sign in using a personal email address and a password they create. Plus, recover or reset their password in real-time. This enhancement will launch in early 2019. 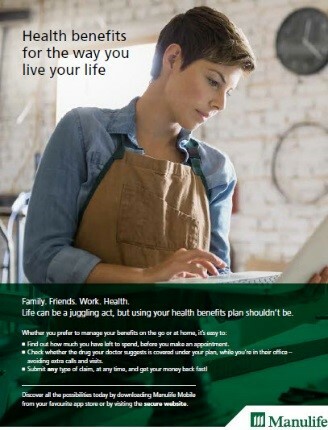 We’re also improving how your plan members choose their benefits online. Starting with new AdminAdvantage™ groups, they’ll soon have a fresh and simple way to manage their benefits and get the most from their coverage. Stay tuned for updates on these new features, and more! 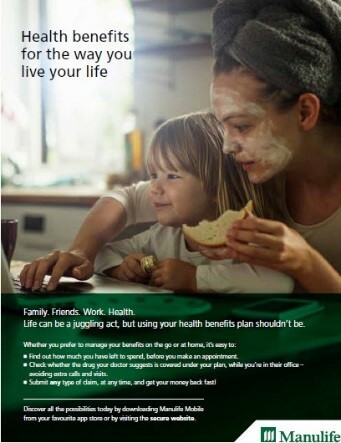 Two new ways to access your benefits! Face ID® - will allow users to use facial recognition to access the Manulife Mobile app through an iPhone X. Making access easier, more convenient and in sync with modern experiences. 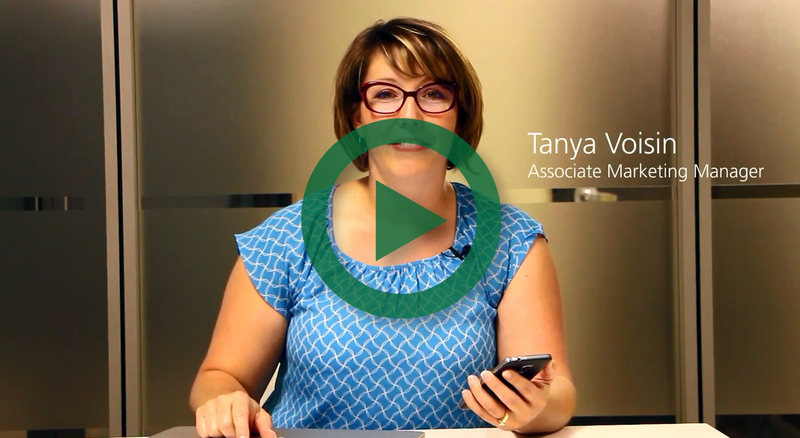 Watch the video to learn how to access Manulife Mobile using facial recognition on iPhone X. Mobile wallet - members can now add their benefits card to Apple wallet and Android WalletPasses-compatible applications. Plan members can interact with their benefits plan using Smart Home Technology! As a first step into the area of Smart Home Technology, we worked with Amazon on the launch of Alexa, a cloud-based voice activated service. Check out the video to see how it works! Initially, Amazon will be launching Alexa in English only. When Amazon launches Alexa in French, we will be ready. 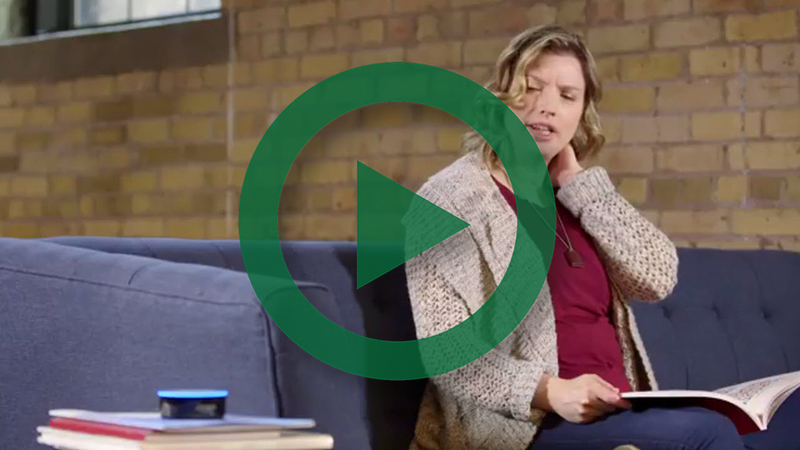 Based on the current Manulife Mobile available balances feature, plan members can interact with their Group Benefits plan through Alexa using only their voice. Users will be required to authenticate their account prior to gaining access to any information. We are focused on improving the member experience at every touchpoint. You can expect to see a lot more innovations in the space of customer experience and usability. 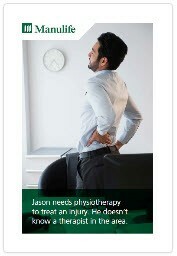 For more information, reach out to your Manulife representative. New search for service provider feature! We upgraded upgraded our online claims tool with great new features. When we add new features to enhance our members’ online experience, some saved information, like service providers, may need to be filled out again. The new search for service provider feature makes adding a provider quicker and easier for our members. 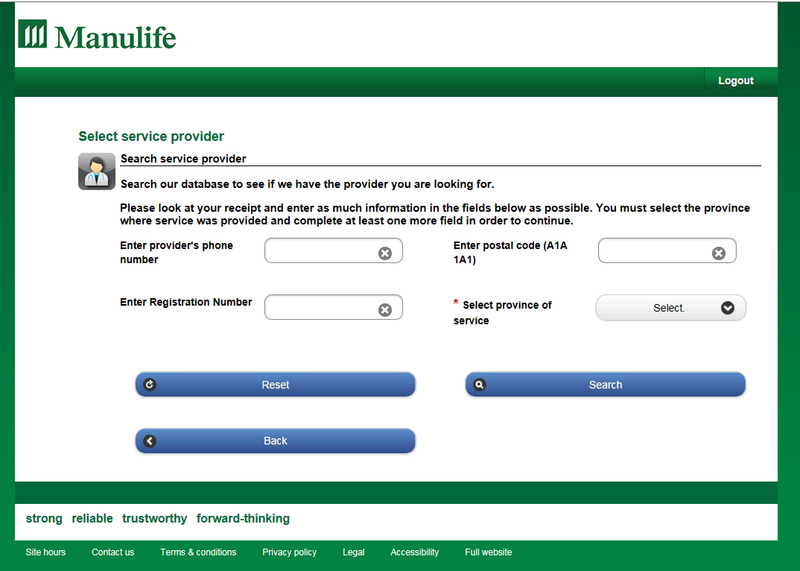 Using search for service provider, members only need to fill out two pieces of information to find their provider fast! If life is a juggling act, we've just given plan members an extra set of hands. The days of expecting plan members to fill out forms or wait for a cheque to come in the mail are over. Smartphones and other technologies have changed the way people do things. They want to interact when and where it's convenient for them, so we've made it easier than ever for plan members to get the most out of their group benefits plan. Check out the member tools we’ve developed below. Or, watch the video to learn more. Find out how much they have left to spend - before they make an appointment. Check whether the drug their doctor suggests is covered under their plan while they're still in the doctor's office - avoiding extra calls and visits. Submit ANY type of claim, at any time, and get their money back fast! Our plan members and providers have told us that our eClaims process needed simplifying. We are pleased to announce we’ve done just that. Plan members no longer need to be registered for direct deposit, electronic claims statements and the plan member secure site before being eligible to submit eClaims directly through their providers. 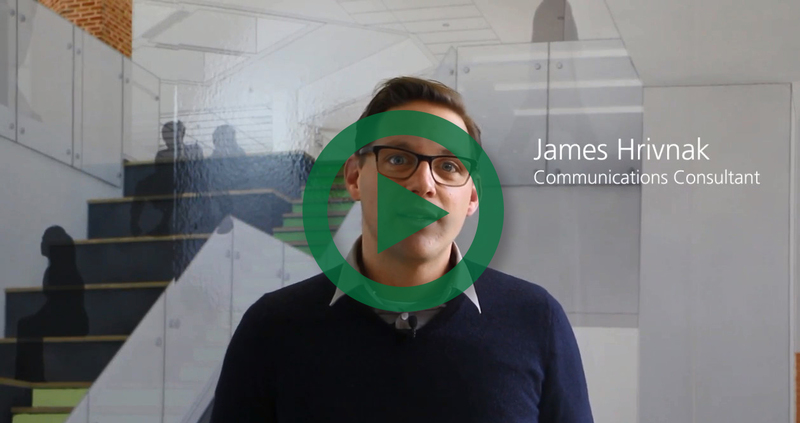 Just another example of how we’re continually creating a better benefits experience. Family members can electronically submit proof of death documents, wills and other documents needed to process a life claim. For those members who were on approved long-term disability or life waiver prior to their death, proof of death documents will not be required. There will be some exceptions for not having to provide original documents. We will work with the families at that time to get the claim processed as efficiently as possible. Online claims just got easier. Plan members can take advantage of two features when submitting group benefit claims. Members can simply select “Other” under Service provider type to submit claims not previously accepted online. They will never have to reach for a paper health and dental claims form again! For times when receipts are required, members can now conveniently include them with their claim. 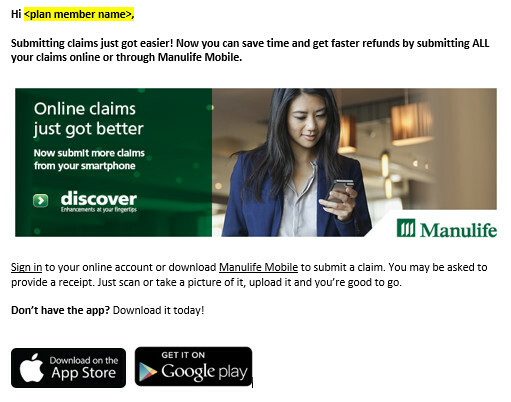 They can scan and upload receipts when they submit online, OR take a picture and attach it with Manulife Mobile. Plan members can quickly and securely send confidential documents through the plan member secure site. Sending information online means it can be processed quicker as members won’t need to mail or fax documents anymore. Members can send these documents as a PDF file or even as a picture file. 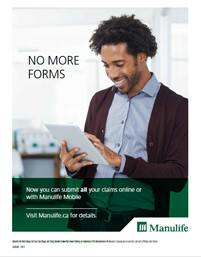 To send a document to Manulife through the site, they just need to sign in, go to the Contact us tab and select Send documents. 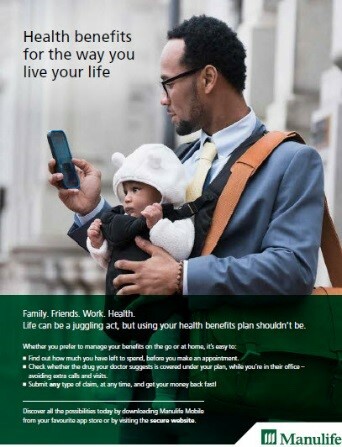 Plan members can now access their mobile benefits card right on their smartphone. It’s easily accessible and is less likely to be misplaced. Use the following materials to promote to your plan members. Your plan members can learn more at Discover. The Provider Lookup tool allows plan members to find registered care providers in an instant from their smartphone. 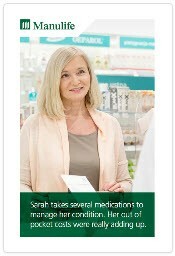 Plan members can use Pharmacy savings search on their mobile device, to learn where they can conveniently find the lowest cost prescription(s) drugs in their current location. 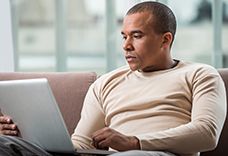 it's now it's easier for plan members to submit coordination of benefits claims online too!